The purpose of this page is to describe how an existing email account may be modified to work with OlympusNet email servers. To check which version of Outlook you’re using, click the File menu, then Office Account in the navigation panel on the left. 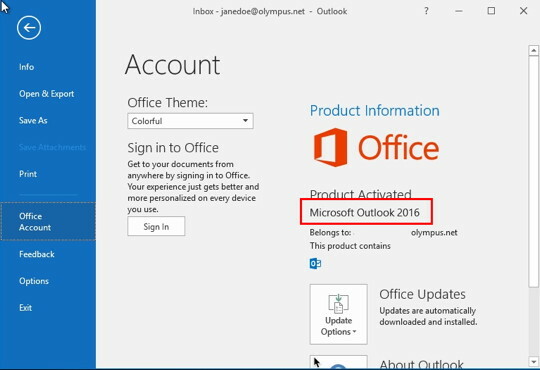 To change settings for Outlook 2016, click File, and select Info in the left navigation margin. 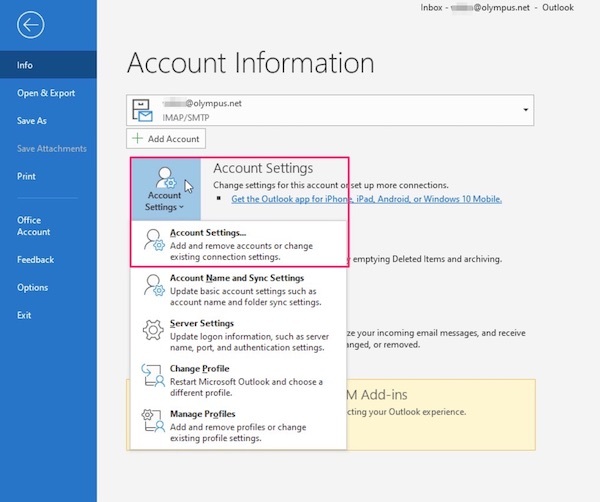 Hover over the down-pointing arrow beside the Account Settings cube on the right and select Account Settings, Add and remove accounts or change existing connection settings below it, as shown in the screenshots below. Click to highlight your email account (janedoe@olympus.net) and then click the Change icon immediately above it as shown in the screenshot below. General settings, Folder settings and Mail settings. If so, select the Next button. The new window is also titled IMAP Account Settings, with sub-headings Incoming mail and Outgoing mail. That’s where User name, password and Server settings are. Follow the text below for the appropriate settings for your account. The screenshot below shows the settings for janedoe@olympus.net, an olympus.net email account. For both Email Address and for User Name beneath Logon Information, enter your full email address (janedoe@olympus.net). The Your Name field is for your name as you’d like it to appear to recipients. Enter mail.userservices.net in both the Incoming mail server and the Outgoing mail server (SMTP) fields. For both Email Address and for User Name beneath Logon Information, enter your full email address (sally@example.com). Enter mailc11.megamailservers.com in both the Incoming mail server and the Outgoing mail server (SMTP) fields. To make other changes, click the More Settings button in the lower right. On the Outgoing Server tab, the correct setting is shown in the screenshot below. Click on the Advanced Tab. For a POP account, the ports should be Incoming 995, Outgoing 465. [IMAP: use 993 Incoming, 465 Outgoing.] Note SSL/TLS should be enabled. Under Server Timeouts, it is best to drag the slider bar to Long. (Auto-check for new email on too short a time span often breaks the sending of large files, sending recipients multiple copies.) If changes are made click OK, then click Next and then Finish, to save changes.